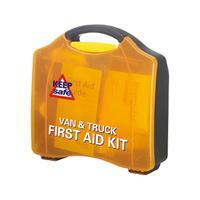 First aid kit packed into neat little polypropylene box with clip on mounting bracket to allow the kit to be fixed into a vehicle. Supplied with an integral wall fixing bracket. 1 X First Aid Leaflet. 20 X Adhesive Plasters (Sterile). 1 X Medium Dressing 12 x 12cm. 1 X Large Dressing 18 x 18cm. 1 X Pair of Scissors. 1 X Support Crepe Bandage.